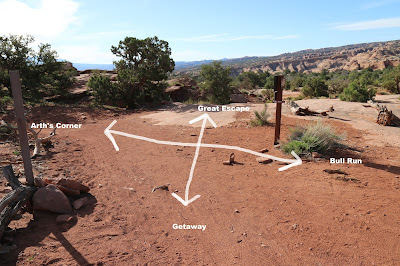 The Getaway trail is in the Gemini Bridges Area near Moab, Utah. 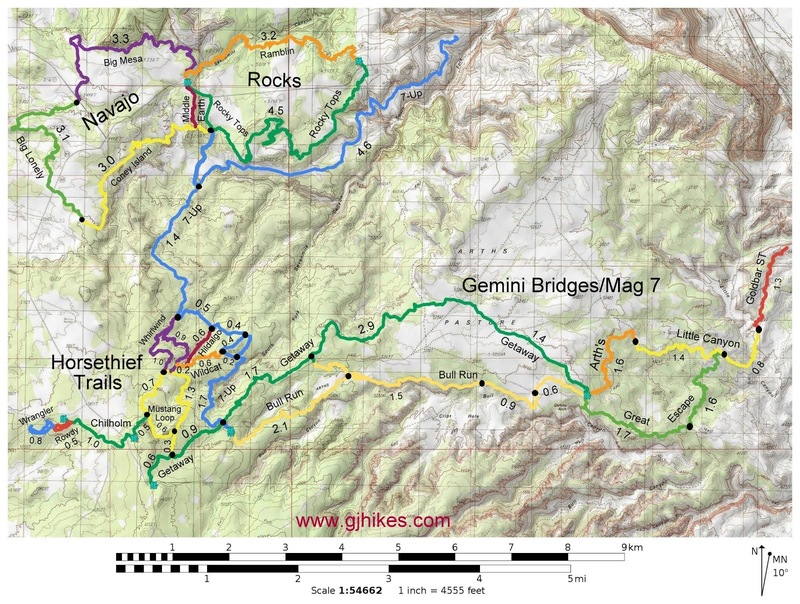 The trail begins near the junction of Highway 313 and the Gemini Bridges Road and stretches for 7.7 miles to where it ends at a 4-way trail junction near the Arth's Corner trailhead. Enroute the trail is connected to by a short spur from the Mustang Loop and intersected by the 7-Up trail and numerous 4-wheel drive roads. At the 3.2 mile point is another spur that connects the Getaway trail to the Gemini Bridges Road and Bull Run. It all comes to an end where the Getaway trail meets up with the Arth's Corner, Great Escape and the Bull Run trails. The Getaway trail has been extended to the point that it now reaches all the way up to Highway 313 which is where this post begins. To get there drive 9 miles north of Moab on Highway 191, turn left onto Highway 313, and continue for about 13 miles to the Gemini Bridges Road. There are several parking areas near the trailhead. As the trail leaves the trailhead it begins its steady descent contouring around the hillside and washes. 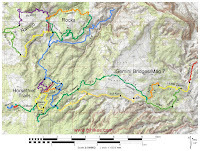 The profile map shows the trails downhill nature that continues over its entire length with only minor sections of brief uphill climbs. At the 0.65 mile point from the trailhead the Getaway trail is met on the left by a short spur that connects it to the Mustang Loop of the Horsethief Trails system. Even though the Getaway trail is downhill in this direction the average grade is only 4%. We have also ridden the trail in the uphill direction and it is easy to keep up a good head of steam. Near the 1.5 mile point the Getaway trail crosses the 7-Up trail about a quarter mile from where it begins at the Magnificent 7 trailhead. A popular loop ride is to begin at the Magnificent 7 trailhead and follow Bull Run downhill and come back on the Getaway trail. Bull Run has an average grade of 5% but it also has several spots that are much steeper so it is easier to ride down Bull Run and up Getaway. From the 7-Up crossing the Getaway trail continues across some slickrock in the direction of Seven Mile Canyon. After a short distance the trail drops down to the level of a bench area that it continues eastward on while it stays below the top of the hill. After a little more than a mile of traveling below the crest of the hill the trail pops back up to the mesa and at the 2.76 mile point passes through a fence line. At the 3.21 mile point the Getaway trail is met on the right by a spur that leads across the Gemini Bridges Road and connects to the Bull Run trail. At one time this is where the Getaway trail began. Everything that we have covered up to this point was built more recently. There is a small parking area along the Gemini Bridges Road where the Bull Run spur crosses it. From the last junction the trail make a short climb to get on top of things and begins working its way east and south over stretches of all types of slickrock and dirt track. At times the trail drops of the mesa for short spurts before climbing higher once again but always continuing to drop elevation overall. At the 5.5 mile point the Getaway trail heads out across a vast open area of low brush. The trail crosses several 4x4 roads through here including the Metal Masher Road. The land still has a slight downhill pitch to it so you can grab some highers gears and make your getaway. Before reaching its endpoint the Getaway trail finds some scenic rocky outcrops to work its way around. Off to the west there are some nice views of the canyons around the Gemini Bridges area. The Getaway trail comes to an end at a 4-way junction where Arth's Corner, Bull Run, Getaway and the Great Escape trails all come together. The Arth's Corner trailhead on the Gemini Bridges Road is only about a hundred feet or so away on the Great Escape trail. With 4 trails and a road all coming together at one place the options for where to go next are many. For us we took Bull Run up to the Mag 7 trailhead and got back on Getaway to get back up to our vehicle. If you would like to see it for yourself then all you have to do is grab your bike or 'Take a hike'.